Alpha Delta Pi (ΑΔΠ), commonly known as ADPi, is a National Panhellenic sorority founded on May 15, 1851 at Wesleyan College in Macon, Georgia. Alpha Delta Pi, a member of the National Panhellenic Conference, which is the governing council of its 26 member sororities. The sorority's national philanthropic partner is the Ronald McDonald House Charities. Its Executive Office is located in Atlanta, Georgia. Alpha Delta Pi was first founded as the Adelphean Society on May 15, 1851 at Wesleyan Female College in Macon, Georgia. The six founders included Eugenia Tucker Fitzgerald, Elizabeth Williams Mitchell, Sophronia Woodruff Dews, Octavia Andrew Rush, Mary Evans Glass, and Ella Pierce Turner. Alpha Delta Pi was the first secret society for women. In 1904, a committee of three, led by Jewel Davis, contacted Attorney Dupont Guerry, the college's president, about to the procedure to become a national organization. They secured a charter of incorporation from the state of Georgia. In 1905, the Adelphean Society changed its name to Alpha Delta Phi. At the time of nationalization, Alpha Delta Phi had 60 active members and 3,000 alumnae. In 1905, Beta Chapter was established at Salem College in Winston-Salem, North Carolina by two members of Alpha Chapter. The chapter had seven members and fifteen new initiates until the administration abolished sororities three years later. In 1906, the Gamma Chapter was founded at Mary Baldwin Seminary. Visitors were not allowed at the school, so the chapter charter and special instructions were delivered to the new group by mail. In 1906, Jewel Davis entered the University of Texas at Austin as a graduate student, organized a group, and installed them as Delta Chapter, the fourth chapter of Alpha Delta Phi. Jewel Davis is listed as a charter member as there was no precedent for affiliation. Today, the Delta Chapter at The University of Texas at Austin is the oldest surviving chapter of Alpha Delta Pi. Between 1906 and 1912, eight more chapters were founded at various universities. In 1913, Alpha Delta Phi officially changed its name to Alpha Delta Pi. The Convention body changed the name of the organization, adopted a recognition pin, and appointed a standardization committee. The trustees at Wesleyan Female College voted to abolish sororities. Chi Chapter, at Wittenberg University was the first chapter to bear the new name. In 1948, Mrs. Carolee Strock Stanard retired as Grand President and part of her keynote address became The Creed of Alpha Delta Pi. In 1960, Alpha Delta Pi's 100th chapter, Delta Omicron, was installed at East Carolina University. In 1971, the Zeta Gamma Chapter was adopted as the first sorority at the University of North Carolina Charlotte's campus. In 1979, Alpha Delta Pi adopted Ronald McDonald Houses as the National Philanthropy. In 1983, Alpha Delta Pi Foundation was established. In 2001, Alpha Delta Pi celebrated its 150th Anniversary in Atlanta, Georgia, and in 2006, the Delta chapter, the oldest open chapter of ADPi, celebrated its 100th anniversary at The University of Texas at Austin. In 2009, Theta Theta Chapter at Quinnipiac University in Hamden, Connecticut was installed. Theta Theta was the 200th chapter of ADPi to be installed. Chapters continue to be installed and anniversaries celebrated at numerous university campuses. In 2014, the Delta Sigma Chapter was reinstalled at The University of Mississippi. The Beta Epsilon Chapter at the University of South Carolina is currently the largest chapter of all sororities in the nation with 415 active members. The open motto of ADPi is "We Live for Each Other," and its colors are azure blue and white. To the sorority, blue is symbolic of friendship, which the sorority cites as one of its founding values; white symbolizes sincerity and truth, which are two qualities the sorority states it looks for in its members. The official flower is the woodland violet; however, since woodland violets are found in the wild and not available for purchase, people often substitute the African violet. The official jewel and symbol is the diamond, which the sorority uses as a symbol of "the enduring strength and value of friendship". 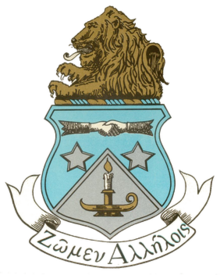 The mascot for Alpha Delta Pi is a lion with the nickname of Alphie. The first mascot was a griffin. Alpha Delta Pi currently has 161 chapters in the United States and Canada, with the majority concentrated in the southern United States, and over 150 alumnae associations. Its national philanthropy is the Ronald McDonald House Charities. Elizabeth Moseley Coles, who was elected national president at the first grand convention, was responsible for having Alpha Delta Pi's coat of arms designed. Another sister of Alpha chapter, Agnes Chapman, is given credit for the actual design of the coat of arms. Symbolism from the ritual and the Alpha pin were combined in the coat of arms, and the design originally had a background of violets. In 1919, the convention body voted to make changes and the present design was accepted. Badge – The first diamond-shaped badge was worn by the Adelpheans in 1851. Stars were not included on this first badge, but it did have a monogram of the Wesleyan pin attached to the badge by a link chain, thus forming a guard. In 1854, the stars were added, but it was not until 1874 that the stars and the clasped hands were raised. This design remained with only slight modifications until 1906 when, at Alpha Delta Pi's first convention, Nanaline King presented a new design for the pin. Her design was a smaller gold badge with a black enamel center which pictured the clasped hands, the two stars, and the Greek letters, Alpha Delta Phi. This design was adopted by the convention and is the same pin we have today, with Alpha Delta Phi being changed to Alpha Delta Pi at the 1913 convention. Alpha Badge – New Member Badge, new members wear a gold pin with a lion atop the Greek letters ΒΥΑ. Jessie Gray (Beta Zeta) – Canada's "First Lady of Surgery"
Kylie Williams (Iota) – Miss Florida 2007; contestant on "Miss America: Reality Check"
^ Nuwer, Hank (1999). Wrongs of Passage: Fraternities, Sororities, Hazing, and Binge Drinking. Indiana University Press. p. 149. ISBN 0-253-21498-X. ^ "Alpha Delta Pi – History". Alpha Delta Pi Executive Office. ^ Pi, Alpha Delta. "History of Alpha Delta Pi". Alpha Delta Pi. Alpha Delta Pi Executive Office. Retrieved 4 August 2016. ^ "Symbols – Alpha Delta Pi". www.alphadeltapi.org. Retrieved 2018-06-13. ^ Pi, Northwest Missouri State University chapter of Alpha Delta. "Alpha Delta Pi | Northwest Missouri State University". nwmissouri.alphadeltapi.org. Retrieved 2018-06-13. ^ "Symbols". Alpha Delta Pi. Archived from the original on 2009-06-07. Retrieved 21 June 2009. ^ Siler, Jennifer. "Adelphean Magazine". Alpha Delta Pi. Alpha Delta Pi International. Retrieved 4 August 2016. ^ Phi, Alpha Delta (12 March 1907). "The Adelphean of Alpha Delta Pi" (1). Alpha Delta Pi. Alpha Delta Pi. Retrieved 4 August 2016. ^ a b c d e f g h i j k l m n o p q r s t u v w x y z aa ab ac ad ae af ag ah ai aj ak al am an ao "Accomplished Members – Alpha Delta Pi". www.alphadeltapi.org. Retrieved 2018-07-27. ^ "The Adelphean Winter 2018-2019". Retrieved 2018-11-30. ^ Bellino, Alexis (2013-10-24). ""#tbt Look what I found... My Mizzou Alpha Delta Pi Sorority pic from 1996!!!! #college #sorority #flashback to #90s #goodoledays #bighair"". Instagram. Retrieved 2018-07-27. ^ "Alpha Delta Pi on Twitter". Twitter. Retrieved 2018-09-29. ^ Dave, Tirusha (2017-04-20). "The Road to Miss Vermont 2017, Julia Crane – Miss Chittenden County". Bravura Magazine. Retrieved 2018-07-27. ^ "Honors & Recognitions". UK Alpha Delta Pi. Retrieved 2018-07-27. ^ Schmidtke, Sloan (October 19, 2007). "Samford alumnae of Little Big Town return to perform". Samford Crimson. Archived from the original on 4 February 2009. Retrieved 5 August 2010. ^ "JAIMIE HILFIGER on Twitter". Twitter. Retrieved 2018-09-29. ^ Wiles, Mary Kate (2015-08-01). ""First. Finest. Forever. #obic #diamondsforever #adpi #💎#sistersfarandwide #geekycon"". Instagram. Retrieved 2018-07-27. ^ "Lauren Catuzzi Grandcolas Foundation: About Us". Lauren Catuzzi Grandcolas Foundation. Archived from the original on 17 July 2006. Retrieved 5 August 2010. ^ "Alpha Delta Pi on Twitter". Twitter. Retrieved 2018-07-27. ^ Staff, Paul Stephen StarNews. "Fox News weekend co-host named Azalea Festival queen". Wilmington Star News. Retrieved 2018-07-27. ^ Docking, Neil (2017-11-29). "Ex-WWE superstar Summer Rae teams up with Paul Heyman for sizzling photo shoot". mirror. Retrieved 2018-07-27. This page was last edited on 21 April 2019, at 22:29 (UTC).